Linebacker DeAndre Levy described the Detroit Lions' defense as "mentally and physically soft" during a second-half collapse Sunday in Philadelphia. ALLEN PARK, Mich. — Linebacker DeAndre Levy described the Detroit Lions’ defense as "mentally and physically soft" during a second-half collapse Sunday in Philadelphia. 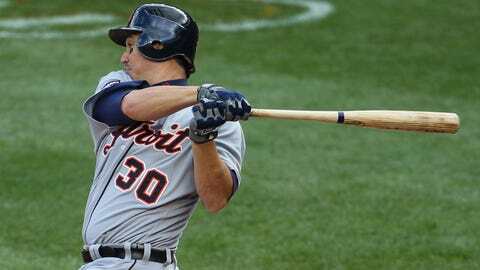 Former Tigers star Magglio Ordonez has been elected as the mayor of a city in his native Venezuela. Coach Jim Schwartz wouldn’t go that far Monday during his weekly news conference. "We didn’t play our best run defense in that game, but I certainly wouldn’t classify our defense as soft," Schwartz said. "We missed a lot of tackles. LeSean McCoy did a good job with the conditions. We didn’t. I wouldn’t put it on anything else. "Players can characterize it any way they want, but when you say that word (soft) it becomes sort of an inflammatory word. "I think you look over the course of the season with us, I think we’re a big, tough, physical team and we’ve played the run well. That game we didn’t play the run very well." No opponent had rushed for more than 62 yards in the previous six games against the Lions, who entered Sunday’s 34-20 loss with the league’s third-ranked run defense, allowing just 82.7 yards on the ground per game. The Eagles, however, broke loose for 244 of their 299 rushing yards in the second half with as much as eight inches of snow on the field. McCoy finished with 217 yards. Philadelphia scored touchdowns on runs of 38, 40 and 57 yards while scoring all 34 of its points in the final 19 minutes, 5 seconds of the game. "I think our run defense is good," Schwartz said. "We don’t want to overreact because of the way that game went and the field conditions. We have confidence in our ability to stop the run. I think over the course of the season we’ve proven that." We have confidence in our ability to stop the run. McCoy credited a change in his cleats — from a half-inch to three-quarters inch, he told reporters — as a reason for his big day. There was some speculation that the Lions should have made a similar adjustment, but Schwartz shot down that factor. "I’d be very surprised if they weren’t wearing the same thing," Schwartz said. "We were wearing the longest possible cleats that were available. It was almost like they (all of the players) were walking around on stilts. Unless they (the Eagles) had snow shoes or something like that. "I think the conditions affected everybody pretty much the same except for two guys, McCoy and Jeremy Ross. Both of those guys were very difficult to tackle. I think it’s more to the style of those players." Ross was the Lions’ top weapon, with a 58-yard punt return and a 98-yard kick return for touchdowns. Cornerback Darius Slay underwent knee surgery Friday, but Schwartz isn’t ruling him out for the season yet, at least not publicly. "He’s just classified as week-to-week, day-to-day, whatever you want to call it," Schwartz said. "We didn’t put him on injured reserve. That probably answers your question." The status of running back Reggie Bush (calf), defensive end Ezekiel "Ziggy" Ansah (shoulder) and offensive tackle LaAdrian Waddle (elbow) for next Monday’s game against Baltimore also isn’t totally clear yet. Waddle actually was cleared to return during Sunday’s game, but the Lions opted to stick with his replacement, Jason Fox, at right tackle. "We’ll just have to see this week with how they respond," Schwartz said, referring to all four of the injured players. "It’s a big game. Every game is pretty critical. I’m sure those guys will do everything they can to get back on the field." The Lions weren’t helped by two seemingly phantom penalty calls — roughing-the-passer against Nick Fairley and defensive holding on Ndamukong Suh — early in the fourth quarter. "One of the things we try to do with penalties is try to learn," Schwartz said. "OK, this is why they called holding on you, this is why they called pass interference, so you can try to learn from it and be in better position the next time. "In these cases, I honestly don’t know what to tell Nick Fairley or Suh on those plays." The penalty on Fairley was particularly important because it turned a potential third-and-10 situation into an automatic first down on a scoring drive. Suh’s penalty gave Philadelphia another chance after getting stopped on a two-point attempt following a touchdown. The Eagles went on to make the second try at the conversion and tied the score, 14-14. "This one he’s trying to hit him in the midsection, he’s getting his helmet out of the way, he’s not late," Schwartz said of the call against Fairley. "He’s almost simultaneous with the pass. "It sort of falls to the league’s point of emphasis and player safety, trying to protect what they consider defenseless players. Your quarterback’s in the pocket, you’re going to get some of those flags thrown. "We have to do a better job playing after that. We can’t blame any of our tackling problems in the fourth quarter on those calls." Schwartz, on the Eagles’ first touchdown, when it appeared cornerback Chris Houston stopped during the play to point out to an official, unsuccessfully, that receiver DeSean Jackson had stepped out of the end zone: "He (Houston) turned inside and DeSean stopped. When he found him again, the ball already had been thrown. Chris was sort of running with him and just kept on running where DeSean stopped. He lost the receiver. I don’t think he quit on the play. That’s the way I saw that one."